Voice Thermo Talking Thermometer – For Those With No Time To Read An LCD Display | OhGizmo! With all the hustle and bustle of daily life, who has time to read a simple LCD display on a digital thermometer these days? Not me, that’s for sure. That’s why I’m replacing my perfectly fine non-talking digital thermometer with this new model from Pro-Idee that will actually tell me the current temperature reading. 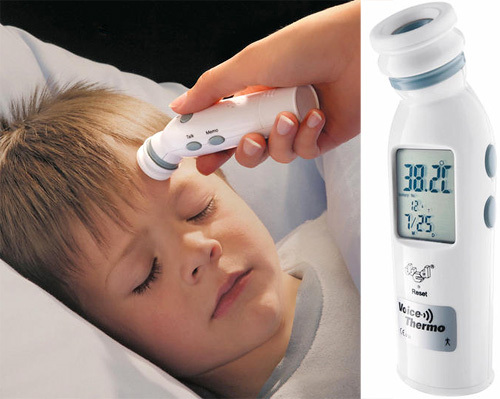 All you have to do is place the sensor on your forehead and using infra-red technology the thermometer will provide an accurate reading (± 0.2 °C) in just 1.5 seconds. Unfortunately the Voice Thermo only has a measuring range of 35.5 to 42 °C, so it’s not really useful as anything other than a medical gadget, but hopefully someday the technological and medical advancements that allow it to talk will make their way to digital kitchen thermometers as well. The Voice Thermo is available from Pro-Idee for about $63. Did you think about blind people?